In 1777 Thomas Fowler was born to Hugh and Elizabeth Fowler of Great Torrington in North Devon, UK. The Fowler family were poor, Hugh was a cooper, and Thomas received only a rudimentary education. He was apprenticed to a fell-monger (seller of skins) at the age of 13. Despite this unpromising start in life Thomas Fowler became arguably one of the great thinkers of his age. "...after a hard day's work among sheepskins he would spend half the night poring over his mathematics, until he had gone as far as to master Saunderson's Fluxions, the name of which the method of the differential calculus, as far as it was then known, was designated. There was no one alas! to take him by the hand, and help him to carry on his studies at Cambridge, where alone such talent as he undoubtedly possessed could either have been fully developed or adequately rewarded, so he was left, without help or sympathy, to his solitary studies." Fowler was self taught with the only book Ward's Mathematician's Guide—John Ward's Young Mathematician's Guide. About 1800 he became a printer and bookseller. Thomas spent his whole life in Torrington. He married to Mary Copp on 21 February, 1813. They had at least eleven children, but, as it was common at this time, several died before reaching adulthood; the average life-expectancy was only 40 in the 1830's. The genius of Thomas Fowler is evident in some of his children, particularly his daughter Caroline, who was composing books, i.e. taking the print and placing it back to front and upside down in a composing stick ready for printing, by the age of eight. In 1828 Fowler patented the Thermosiphon (British Patent number 5711). This was to become the modern central heating system. A heating system based on a design by Thomas Fowler was installed at Bicton, then part of the Rolle Estate and received great acclaim in the Gardener's Magazine of 1829. "Mr Fowler has had the good fortune to hit on the idea that water may be heated and made to circulate through a siphon, as well as through horizontal pipes, or by force through pipes in any direction; provided always, that the height of the siphon be not greater than to be counter-balanced by the pressure of the atmosphere; say not greater than 30 feet. Any person might have discovered the same thing by reflection, or in answer to the question asked; but we are not aware that the idea has occurred, either to the original inventor of the hot-water system, Bonnemain; to its introducers into England, Bolton and Watt; to its subsequent introducer; Chabbanes; to Count Romford; and to its reinventors, or English inventors, Atkinson and Bacon; or to any to any of the numerous engineers now occupied in applying this mode of heating." "Unfortunately the invention was soon pirated in all directions. The only remedy was costly legal proceedings, but even if he had had the means to conduct them, success would have been doubtful." Fowler became very embittered by this experience and this had an unfortunate side-effect on the history of computer science. 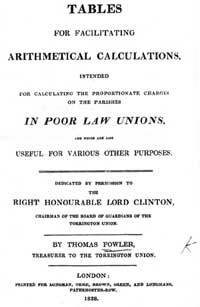 In 1835 Fowler became the Treasurer of the Poor Law Union and partner in the bank Messrs. Loveband & Co. in Torrington. The tedious nature of the calculation of payments for each of the parishes, which was one of his responsibilities, led him to attempt to automate the calculations by the use of tables. Fowler's solution was typically brilliant and led, in 1838, to Fowler's "Tables for Facilitating Arithmetical Calculations". Soon after he had devised the tables he used the same ideas to build a mechanical calculating machine (see the machine of Fowler). First variant of the machine was exhibited before members of the Royal Society in May 1840. Two years later he made an improved version. Thomas Fowler died on March 31, 1843, of Dropsy of the Chest.